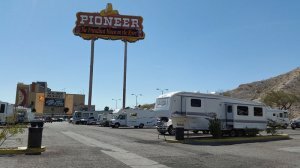 We stay here when passing through Laughlin on the way to Las Vegas, last time Nov 2015. The overnight parking is free and the parking lot large and level, plenty of space to spread out. The folks in the casino, including security, are friendly and we always feel welcome. Food in the cafe is nothing to brag about but edible. The casino is old and smokey but fun, like stepping through a time portal, they even have some old coin-dropper slot machines.